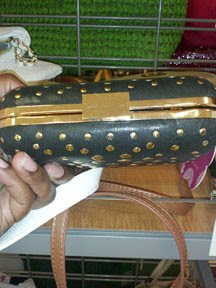 Box Clutch handbags are really hanging strong season after season and are becoming a MUST HAVE piece that needs to be added to your wardrobe. 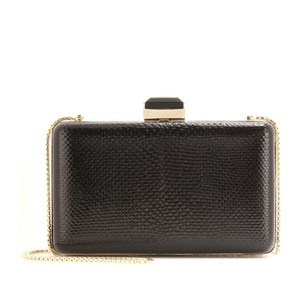 The box shape is one of many shapes that the smaller size clutch come in, but for the most part the shape will be four sided, in a square or rectangular shape with different depths and different closure styles. 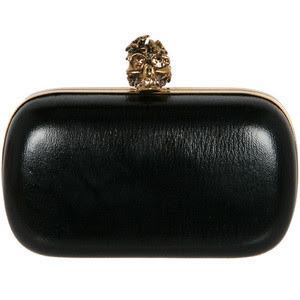 The first black clutch is from A. McQueen and priced at $1495. And the second black clutch is from Lanvin and is priced at $1750. 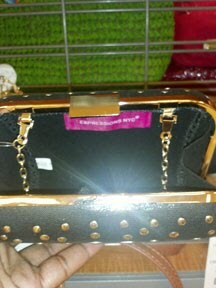 The third black clutch is by Design Expressions a Notable Styles Personal Shopping Find and looks very similar to the other two, has gold hardware, a gold chain and gold grommets on the outside and is priced at $20.